Dubai: Scalpers are making a killing from the UAE vs Qatar AFC match, as football fever gripped the nation, with tickets running out days before the Gulf teams lock horns on the pitch. The UAE and Qatar will play against each other on Tuesday January 29, 6pm, at the Mohammad Bin Zayed Stadium in Abu Dhabi. The demand for tickets to the AFC Asian Cup semi-final match on Tuesday has shot through the roof ever since the hosts stunned defending champions Australia on Friday. Gulf News tried to "book" two tickets at a booking site on Sunday. The cost of lowest category 3 (Row J) seats, which usually go for Dh50 each, was going for Dh992 per ticket — along with a booking fee of Dh285 and handling fee of Dh9 per ticket. Together, the price of two tickets was an exorbitant Dh2,573. Organisers had earlier instructed that all remaining tickets for the semi-final will be purchased by the Abu Dhabi Sports Council (ADSC) and distributed free of charge to all UAE supporters. 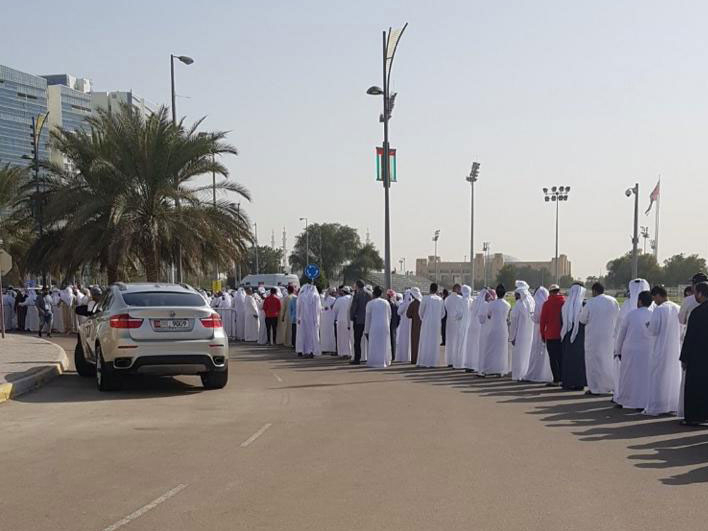 UAE supporters went in droves to collect their football tickets, although many were unfortunately turned away due to the unexpected demand that vastly surpassed the availability of seats. Tickets for the historic clash were handed out at 10am at football venues across the country but within two hours, were already swiped up completely at Sharjah Sports Stadium. The Sharjah Sports Council announced on their Instagram account that all the free tickets were gone by 12pm. Tickets were also distributed at Hazza Bin Zayed Stadium in Al Ain, Al Wasl Club in Dubai, Sharjah Sports Stadium, Emirates Stadium in Ras Al Khaimah and Fujairah Stadium. UAE football fans unable to acquire a ticket expressed their disappointment across social networking sites, even though they stood in queues for more than one hour. @32h_hh said that he waited in line since 9am and still did not manage to get a ticket, due to the bad organization of the event. By 12.30pm, all free tickets that were distributed across the nation had also run out. “Where did all the tickets go? Is it possible that only 600 tickets were available at Sharjah Club,” tweeted @wldaltheeb. However, one of the unofficial websites were cashing in on the demand, selling tickets — at a premium. The website claims to be the world’s "largest secondary marketplace" for tickets to live events and that prices are set by sellers, stating it may be below or above face value. When this report was being filed, around 230 tickets were still available at Dh992 for two. 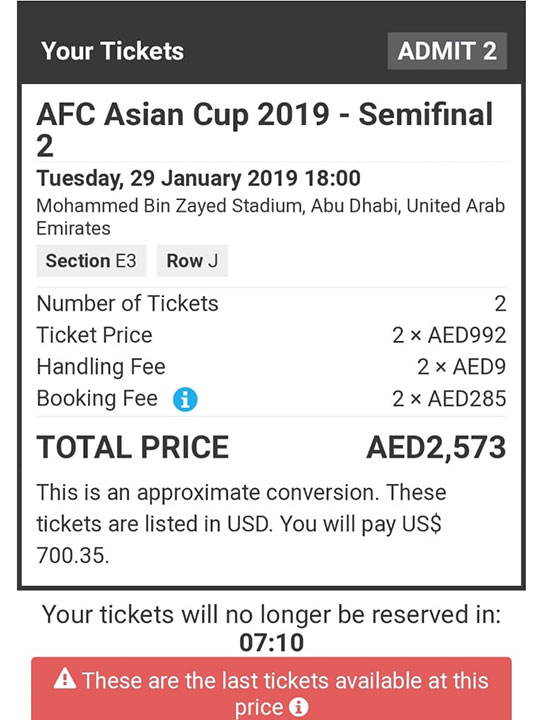 When the newspaper complained to Asian Football Confederation (AFC) about this parallel online sale, the official spokesperson responded: “As stipulated in the ticketing terms and conditions, tickets sales by unauthorised providers is strictly prohibited. Tickets are also on sale on the social media, where the Category 1 ticket worth Dh150 is being sold between Dh900-1,000 by the scalpers. Category 2 tickets worth Dh75 were listed for Dh500 each. This match is expected to be a high-octane contest. UAE veteran Esmail Mattar has revealed that the contest will be all about on-field duel. “I think we will not go so far and we will keep it in the field. We will play against Qatar as we play against any team. We don’t have to take it any further than that,” said Mattar.